The sisters Kardashian: Khloe, Kim, and Kourtney celebrate their Redbook cover in West Hollywood. 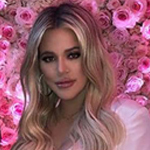 Though they sport similar all-white ensembles on the May cover of Redbook, the Kardashian women showed off their individual style at a party the magazine hosted in their honor at West Hollywood’s Sunset Tower Hotel on April 11. Big sister Kourtney sizzled in a fiery red strapless jumpsuit, while middle sis Kim opted for a a sleeveless, drapey gray and black top with black pants. Meanwhile, Khloe, the youngest of the trio, wore a belted black skirt, crisp white shirt, and black bow tie. Kim said she is a fan of her kid sister’s style. Khloe, however, doesn’t necessarily believe she’s ready for fashion-icon status just yet. That’s not to say they don’t raid each other’s closets and share clothing. The sisters aren’t the only ones who steal each other’s styles—mom Kris Jenner confessed that she borrows handbags from her daughters. Wearing a white dress with a dark jacket to the event, the matriarch also revealed that her secret to looking good is to wash her face and moisturize every night, and to feel beautiful from within.